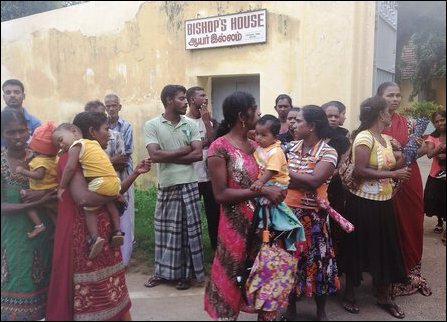 The families, relatives and friends of 3 Eezham Tamil fishermen who received death sentence with 5 Tamil Nadu fiserhmen on the accusation of smuggling drugs into the island, gathered in front of Bishop’s House in Jaffna on Friday and claimed that the fishermen had been framed by false charges and the verdict by the Colombo High Court was based on lies. The protesters handed over an appeal to Rt. Rev. Dr. Thomas Soundaranayagam urging the Bishop to intervene to ensure the safety of the eight Tamil Nadu and Eezham Tamil fishermen. 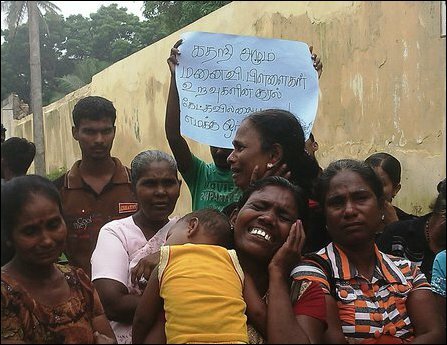 The protesters claimed that the fishermen were not involved in any anti-social activity and that the 8 fishermen have been victimised with political motives by Colombo and New Delhi. 28.09.11 Regimes in Sri Lanka, Maldives, forge questionable..